Woodstock, Vermont has not been left out the craft beer craze that has swept the nation over the last ten years. 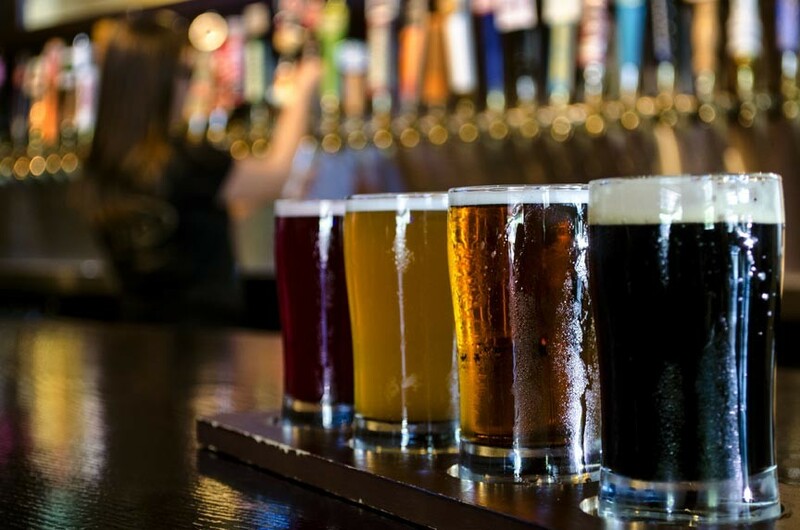 In fact, there are a number of craft beer breweries near Woodstock, enough to create your own craft beer trail! Quaint shops, great restaurants, and attractions like Billings Farm and the Simon Pearce glassworks make Woodstock a quintessential New England town. The lovely scenery alone makes us the ideal getaway for those looking for a respite from the hustle and bustle of the modern world. Perhaps best of all, at least for the craft beer enthusiast, there are a number of great beer stores and breweries near Woodstock. Enough for a weekend’s diversion as you follow along on your own Vermont Craft Beer Trail! Brewfest Beverage Company isn’t a brewery but rather offers an extensive selection of craft beer and fine wines from around the country and the world. Refillable growlers from their rotating taps and brewing supplies are also available. A warm, easygoing hang out with a fireplace and mountain views offering pub grub and house-brewed drafts. Open for lunch and dinner. Harpoon Brewery started up in 1986 in a warehouse space on the Boston waterfront. They have only grown, along with the craft beer industry, and now have a second location, a beautiful brewery in Windsor, Vermont. Stop in at either location for a full selection of beers along with delicious food to pair with your pint. Guided brewery tours also available. Hop’n Moose Brewing always has 8 to 12 carefully crafted ales and lagers on tap, along with wood-fired brick oven pizza, burgers, and more. The brewery features live music every weekend and outdoor seating during warmer weather. Long Trail Brewing has been brewing high-quality craft beer since 1989. They combine the very best ingredients available with an environmentally minded brewing processes to produce a family of fine ales. Enjoy a drink and a bite at their riverside pub and restaurant, inspired by the Hofbräu House in Munich, Germany. The Norwich Inn Brewery is the home of Jasper Murdock Ales, only available from the Norwich Inn. The brewery uses an extended cold-aging process to allow the yeast to settle out naturally, rather than stripping it out – along with lots of flavor – using filtration. Enjoy at the inn’s pub or call ahead to order bottles and kegs for pick up. Trout River Brewing Company was founded 1996 and prides itself on delivering quality traditional style ales with a personalized touch. Woodstock Hops N’ Barley isn’t a brewery but, rather a family owned store offering 13 rotating tap lines for growler fills and over 700 different kinds of beer and wine. They also offer keg sales and home brewing supplies. Men’s Journal placed them in the 50 Best Beer Stores in America. Vermont was recently ranked as the state with the largest number of breweries per capita and growing! Our list above only touched on craft beer sources within an hour of Woodstock. By the time you read this, there will be even more breweries within that circle! Beyond that 1 hour circle, there are even more great craft breweries and supply houses. The point being, if you’re a beer enthusiast, Vermont is the state for you! Deer Brook Inn is your best bet for comfort, service, and value no matter what brings you to our neck of the woods. The four spacious guest rooms and suites in our Woodstock B&B will help you to relax and enjoy your Vermont vacation in a way that no hotel or motel ever could. Make your reservation today at Deer Brook Inn.